Car Stoppers prevent cars from pulling too far into residential or commercial parking spaces and visibly mark each parking space. 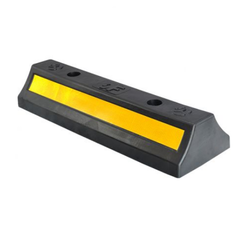 These car stoppers prevent vehicles from damaging sidewalks, buildings, curbs, and landscaping. In addition to parking lots and outdoor parking spaces, our car stoppers may also be used in garages to prevent the driver from pulling too far forward. We have over two decades of vast industrial knowledge and experience in producing superior quality Parking Car Stopper. We are long-time established manufacturer, distributor, importer and exporter of Car Wheel Stopper. Our Wheel Stopper is being exported to global regions like of Middle East, Africa, South Asia, Latin America, Europe, Bangladesh, Bhutan, Nepal, Sri Lanka and many more. Looking for Car Stopper ?